Gisol – Scientific name: Kaempferia galanga Linn. Smooth, stemless herb arising from tuberous aromatic rootstocks with fibrous cylindric roots. Leaves are horizontally spreading, orbicular to broadly ovate, 7-15 cm long, with rounded base. Flowers are few, about 4-6. with lanceolate bracts. Corolla tube is slender, 2-3 cm long with a lip cleft in the middle. Staminodes are obovate, about 1-2 cm long. Mumps: Chop the rhizomes. Apply directly as poultice on the swollen glands for 30 minutes 3 times daily. The rhizome mixed with oil is an effective cicatrizant (healing by scar formation). Leaves, topically, for sore throat. Sliced rhizomes topically to furuncles to hasten ripening. Poultice and lotions of leaves and rhizomes for sore throat, fevers, swellings, rheumatism. Rhizomes used as wash for dandruff or head scabs. Leaves used as perfume in washing hair. Internally, decoction of rhizomes used as a tonic; also, for dyspepsia and malarial chills. 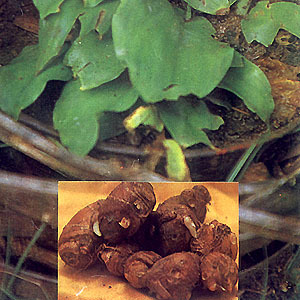 Rhizomes have been used postpartum. • In China, decoction or powder used for indigestion, colds, abdominal pains, headache and toothache. This entry was posted in List of Medicinal Plants in the Philippines on March 12, 2009 by Pinoy Herbs.